The term Men in Black now has comic connotations for most of us, having become famous through the Hollywood films of the same name starring Tommy Lee Jones and Will Smith, as secret agents working to keep Earth safe from “alien scum.” The real Men in Black are not funny at all, however. They represent one of the creepiest, most sinister and most genuinely frightening aspects of the UFO phenomenon. It all started in the 1950s. Those who had seen UFOs and had gone public with their testimony started receiving odd visits from mysterious strangers. These were the Men in Black (MIB) – although occasionally a woman would be present too. Typically, they would just turn up on the doorstep, often phoning beforehand, usually arriving three at a time. 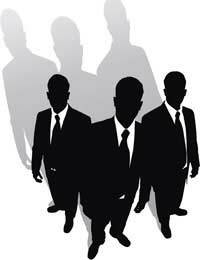 As the name suggests, they would usually be dressed in standard black business suits. But there was something odd about their appearance. Those who were contacted by them often commented afterwards on how old-fashioned but curiously new their clothing looked – as if it had just been manufactured. And not just their clothing – the cars they arrived in would, likewise, be dated in style and just a little too perfect. But that wasn’t the oddest thing about them. Very often their bodily appearance was strange too. Often, they were described as having no eyebrows or even painted-on eyebrows. Some of the men even wore lipstick. Who were the Men in Black? What lay behind the mystery of the Men in Black? Were they aliens who were somehow able to transform their appearance, however imperfectly? This explanation would make sense if the aliens wanted to conceal their presence on Earth and it would fit with the observed strangeness in their appearance and behaviour. A variant on this idea is that the Men in Black may have been some kind of androids created by the aliens to carry out their wishes – perhaps specially manufactured for the occasion. This would account for the “brand-new” appearance of their clothes and belongings. An alternative explanation is that the Men In Black were government agents. But then why would they look and act so strangely? One theory is that they were government agents pretending to be aliens who were pretending to be humans – all in an attempt to terrify the witness. If they were government agents, what would their ultimate motive have been? Why would the government be concerned about suppressing UFO reports? Multiple interpretations are possible. It could be that the government is already aware of the alien presence, doesn’t really know what to do about it, and wants to suppress knowledge of it for fear of inciting public alarm. Or the government may have an established relationship with the extra-terrestrials which, for some reason, it wants to conceal. Alternatively, there may be no aliens. UFOs may be a “black” project which the government wants to keep quiet for national security reasons. Or it could all lie in the imagination of paranoids, or the fabrication of fraudsters. Some MIB visits had multiple eye-witnesses, however, who included among their ranks credible people who were unknown to the person being visited - so it seems unlikely that they were entirely imaginary. The Men in Black represent one of the most intriguing aspects of the UFO mystery. Most reports of them date from the 50s, 60s and 70s, however. It is not clear whether they are still active. But if you see an old-style black limousine cruising down your street one day, perhaps you’re about to receive a visit. Not to worry, though – although the Men in Black made many threats, they are never known to have made good on them. I waas told of numerous encounters with the M.I.B's from a friends mother. She described a circumstance in which she discovered hidden missles in texas. She was told not to say anything to anyone. She mentioned that they tried to intimidate her every once and a while by following her and showing up to her house. She also mentioned another huge secret. The discovery of aliens living amongst us. While she was working construction she overheard the people in the neighborhood discussing how to make their appearence as humans realistic. the women had many empty baby carriges that they were strolling around the neighborhodd with. they were discussing what would be an appropriate time for them to have there babies. They paid her no attention as she had already earned government clearance for previous witness accounts.